Disclosure: I received free product in exchange for writing this post. So as many women are, I'm a big fan of lip balms. 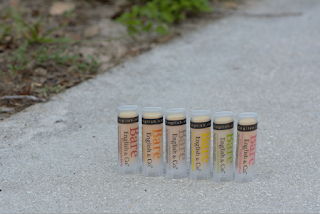 There's nothing worse then having dry cracked lips - So I know the importance of always being prepared, and constantly having at least one lip balm with you. I also know that there are so many different types of balms. There's a lot of flavors, and there are a lot of different textures. Personally, I love a smooth balm that nicely glides on, and that's exactly what Bare English lip balms do. It's hard to explain, but when you're putting it on, it just feels like butter gliding across your lips (lol.) It's almost like the balm is thicker, and just gets you full coverage, which for me, is important. And when you look at the ingredient list, you just know you're doing your lips a favor. Each of there balms contain candelilla wax, jojoba oil, almond oil, cocoa butter, vitamin e, coconut oil, olive oil, and castor oil. 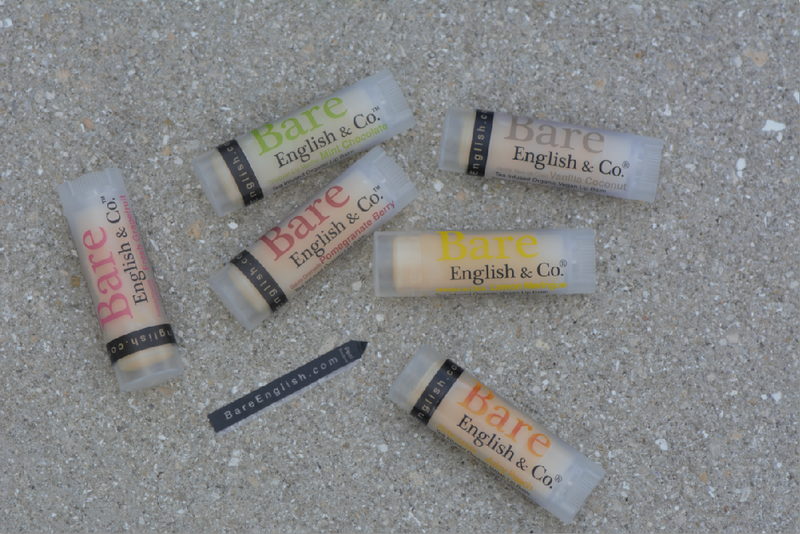 And Bare English & Co. takes pride in not using petrochemicals, oxybenzone, BHA, or parabens. Now all of that is great about Bare English, but my favorite part...? The amazing flavor options! I received 6 balms total, all with amazing sounding flavors. I received Mint Chocolate, Vanilla Coconut, Lemon Meringue, Juicy Peach, Pomegranate Berry, and Pink Grapefruit. I didn't want to be selfish keeping 6 for myself, so I gave 3 away to my boyfriends sister, and then I kept the Lemon Meringue, Mint Chocolate and Juicy Peach for myself. I personally LOVE the lemon meringue, and I would definitely purchase another. Overall, I'm very happy with Bare English & Co. They have great products, and affordable prices! 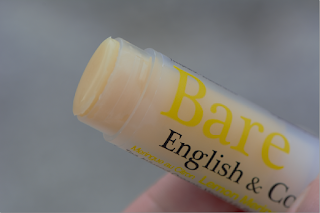 Disclosure: I received free lip balms from Bare English & Co., for free, in exchange for this review. All opinions expressed within this post are our own, and were not influenced in any way. Must be 18 years or older to enter. Open to US only, No P.O. Boxes. NO PURCHASE NECESSARY. This giveaway starts on May 21st, 2015, and will end on June 2nd, 2015. Winner will be drawn via Random.org via Rafflecopter, and announced on top of the Rafflecopter form, as well as on the top "Winners" page. The winner will be emailed and will have 48 hours to respond to my email before a new winner will have to be drawn. If you're tweeting for entries, you must have an "unlocked" account. The number of entries received determines the odds of winning. VOID WHERE PROHIBITED BY LAW. I want to try lemon meringue. I would really like to try the lemon meringue lip balm, it sounds really unique and different. Thank you. I would like to try the Fresh Grapefruit the most. I would love to try Fresh Grapefruit! YUMMM! I would like to try the Juicy Peach. I would most like to try the tinted cherry lip balm. They all sound great but I'd like to try Mint Chocolate most. I would love to try Cherry Berry or Vanilla Almond. The lip balm I would like to try the most from Bare English is the Tinted Cherry Kiss . I'd love to try the Fresh Grapefruit!